Administrator: is defined as the service who manages the Program in each country. The contact details of such administrator can be found by logging in My Europcar in the Loyalty program section and by selecting the relevant country as well as in the About us section of the Website. Europcar Privilege stations: are defined as all Europcar stations providing the Privilege member with the Ready service. Worldwide Europcar stations are hereby listed www.europcar.com/car-rental.html and may be amended from time to time. Privilege credits: are defined as the unit values, counted in credits and determining the Privilege Member’s Status. The Privilege Credits are generated both by the number of Qualifying rentals and the number of Qualifying days credited to a Privilege Member over a Qualifying period. One credit is either equivalent to one Qualifying rental or to one Qualifying day. Privilege credits do not constitute a Payment ID and cannot be converted into money. Privilege Members will earn Privilege Credits for their short term rentals only. Long term rentals of 29 days and above will be granted a flat amount of qualifying days fixed at 28 days. In addition, qualifying rentals are based on rates including all public, corporate and promotional rates with the exception of the rate groups listed in the Qualifying rate section below. Privilege ID card: is defined as the membership identification card provided by Europcar after the first Qualifying rental or Qualifying day to each Privilege member who chooses the Privilege ID card option in the Privilege enrollment form,. The Privilege ID Card does not constitute a valid Payment ID. Privilege member: is defined as a driver who has enrolled into the Program. Privilege status: is defined as the level a Privilege Member has reached in proportion of his/her Privilege credits. There are three Privilege Statuses: Privilege Club (entry level), Privilege Executive (frequent renter level) and Privilege Elite (top frequent renter level), each allowing the Privilege Member to benefit from specific advantages. The Privilege status taken into account is the status reached by the Privilege member at time of pick-up. Qualifying day: is defined as each day of a Qualifying rental. For instance, a one day Qualifying rental is both a Qualifying day and a Qualifying rental. Qualifying period: is defined as the period during which the Privilege member may earn privilege Credits. A Qualifying period is a twelve months period starting on January the 1st and ending on December the 31st. Privilege credits are reset every 31st of December. Qualifying rental: is defined as a Vehicle rental, made in any Europcar Privilege station and linked to a Qualifying rate, allowing Privilege member to earn Privilege credits. The Program is a free of charge program, offered by Europcar in order to reward its drivers for their loyalty in proportion of their Vehicle rental frequency. Drivers who enrol into the Program will benefit automatically from the Ready Privilege Express Service, when available, and earn Privilege credits in order to reach one of the Privilege Statuses and their related advantages. All information about the Program may be found in the Loyalty Program section of the Website. - get his/her company to stamp the Privilege enrollment form and to fill in the contract number linked to the relevant Business account, if any. Drivers subscribing to the Program cannot be enrolled into another Europcar card loyalty program in any country whatsoever. - For all paying Europcar programs (i.e. : “Funway”, “EuropcarClub”), the Driver will have to wait until the expiry date of its current card to enrol into the Program. - For all free of charge Europcar programs (i.e. “Funway” in Netherlands & Sweden), the Driver will be opted-out at Privilege enrollment time. The Privilege Member won’t be able to benefit any longer from the benefit of such programs but will get all the advantages related to the Program. The Privilege Program does not exist in the United States. To obtain more information on the USA loyalty program check the Terms and Conditions of the Emerald Club Program available via the following link. - the expiry date for his or her current Status for Privilege Executive and Privilege Elite Members (Privilege Club Member ID cards have no expiry date); the expiry date is the last calendar day of the month displayed. - the ‘charge card’ mention if applicable together with the related Business Account at the back of the card. - the signature of the Privilege member at the back of the card. The Privilege Card is sent by post to the Privilege member following his/her first Qualifying rental or Qualifying day. In order to benefit from the advantages of the Program, the Privilege member must indicate his or her Europcar ID when making a reservation and show the Privilege card at pick-up time at the relevant Europcar counter. If the Privilege card is lost, damaged or stolen, the Privilege member must inform the Administrator of his/her country of residence by phone or email: the relevant contact details are available online in the About us section and in the Loyalty Information section of My Europcar once logged-in. In order to get his/her Privilege card replaced, the Privilege member will need to quote his/her Europcar ID. Europcar will replace the Privilege card at no cost. In the meantime, the Privilege member can use his/her Europcar ID to be identified and benefit from the Privilege benefits. Each Privilege member will benefit from a faster rental process: the "Ready Service". The Ready Service is guaranteed in the participating stations. By enrolling into the Program, Privilege members accept that their personal data collected in the Privilege Enrollment form will be saved on a computerised database and used in order to speed up the rental process. For instance, the Privilege member won’t need to fill in this information for each rental. The Privilege member personal data will be stored under a Europcar ID. Therefore, by logging into his/her My Europcar or by quoting the Europcar ID over the phone or at counter, Europcar will have access to the Privilege member data. Such information will also be pre-printed on each rental agreement so that the Privilege member only has to select the relevant rental time and place as well as the Vehicle category. The Privilege member will be able to access and change his/her personal data at any time by logging in his My Europcar section. Options not available online such as optional insurances will not allow the Privilege member to benefit from the "Ready" Service as he/she will need to directly ask for them at the counter. 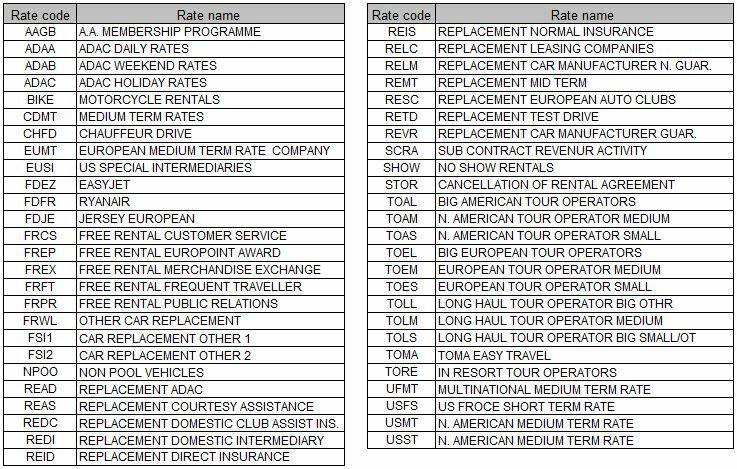 In some Europcar Privilege stations in Germany, the Privilege Member will be able to benefit from the Ready Service directly at a Ready Terminal (see list below). By signing up the Privilege Enrollment form online, the Privilege member accepts for his/her Payment ID to be charged with all amounts related to the rental without having to sign the rental agreement at the counter unless the local law of the country of rental expressly forbids such practice (e.g. South Africa and Portugal). If the Privilege member chooses the “prepayment” option, the payment of the rental price will be charged on the Payment ID at time of booking and additional charges, if any, will be charged at time of check-in. When the Privilege member chooses to “pay at station”, the Payment ID will be automatically charged with all sums related to the rental at time of check-in without the Privilege member having to show such Payment ID at counter. The payment ID will be the one provided by the Privilege member on the enrollment form to the exclusion of any other means of payment. If several Payment ID appear on the enrollment form, the preferred Payment ID will be the Privilege Charge Card and otherwise the first preferred valid bank card. - a guaranteed reservation meaning that the Europcar pick up station is required to provide the requested Vehicle category until the station closure or up to 12:00 (noon) the day following the due pick up time for 24/7 stations. - an access to his/her Privilege profile information 24/7 on My Europcar section online. - the ability to earn miles/points from your preferred frequent traveller program. - One free weekend rental per year for 2 to 3 day weekend rentals including a Saturday night, once the activity level of 25 qualifying rentals or 85 qualifying rental days is reached as of Elite status start date. The Privilege Elite Member will receive, exclusively via e-mail to the email address provided at enrollment time, a dedicated URL address to access the Privilege Elite free weekend booking website enabling the Privilege Elite Member to book and issue his/her free weekend e-voucher. The following stations in Belarus are excluded from this free weekend benefit : Brest railway station; Grodno railway station; Gomel railway station; Mogilev railway station; Vitebsk railway station. In booking his/her free weekend, the Privilege Elite Member must read and accept the specific terms and conditions applicable to the Privilege Elite free weekend benefit. A Privilege member switches from one Privilege status to another in proportion of his/her Privilege credits. After his/her enrollment to the Program, the Privilege member automatically becomes a Privilege Club member and starts earning Privilege credits to reach the Privilege Executive status. Privilege members qualify for the Privilege Executive status when they reach either 10 (ten) Qualifying rentals or 40 (forty) Qualifying days during over a Qualifying period. Privilege members qualify for the Privilege Elite status when they reach either 25 (twenty-five) Qualifying rentals or 85 (eighty five) Qualifying days over a Qualifying period. Each Privilege member can have his/her Privilege Status upgraded as soon as he/she reaches the necessary number of Privilege credits. This number can be reached either by reaching the necessary number of qualifying days or the necessary number of qualifying rentals over a Qualifying period. The Privilege member will benefit from this new Privilege Status as soon as he/she reaches the necessary amount of Privilege credits and for the end of the current Qualifying period as well as for the following one. A member can be upgraded twice a year. A Privilege member will be downgraded if the Privilege member does not earn any Privilege credit over a Qualifying period or does not reach either the necessary amount of Qualifying rentals or the necessary amount of Qualifying days to satisfy the conditions of his/her current Privilege Status. The Privilege member will however be upgraded as soon as he/she reaches the necessary amount of Privilege credits to benefit from a higher Privilege Status. The Privilege member can only be downgraded to the next lower level over a Qualifying period and will at least benefit from the Privilege Club advantages. In case of upgrade or downgrade, a new Privilege card will be sent to the Privilege Member within 2 weeks maximum). By enrolling into the Program, the Privilege member acknowledges that he has read and understood the present Specific terms. The Privilege member warrants that the information provided on the Privilege enrollment form is true, complete and accurate. The Privilege member undertakes to notify Europcar via the My Europcar section of any change in his/her personal data provided in the Privilege enrollment form including without limitation any change in his/her billing address, driving licence details, change of Payment ID. The Privilege member shall notify Europcar in writing of any condition that would impair driving ability as well as of any loss or theft of the Privilege card. The Ready Privilege Express service will only be available in the Europcar Privilege stations and in countries where local law does not expressly forbids such service. Europcar will make its most reasonable commercial efforts in order to provide the Privilege member with the Ready Privilege Express Service. However, Europcar shall not be liable for any loss, damage or expense resulting from the failure to provide the Privilege member with the Ready Privilege Express Service. If, for any reason whatsoever, the availability of the Ready Privilege Express Service cannot be offered to the Privilege member at pick-up time, the rental transaction will be processed according to Europcar standard rental procedure. At any time, the Privilege Member may cancel his/her enrollment by sending a one month priori notice via registered postal mail to the Administrator of his/her country of residence, the address of which can be found in the Loyalty information section of My Europcar once logged in or in the Headquarters section of the About us pages. This will imply the complete withdrawal from the Program, thus permanently ending the benefits related to the Program. After a period of three (3) years without any Privilege credit earned by a Privilege Member, the Privilege card will be automatically terminated. The Privilege card remains the sole property of Europcar and may be returned to Europcar on demand. Europcar may amend the Privilege Loyalty Program Specific Terms from time to time. The Privilege member shall therefore refer to the latest version of the Privilege loyalty program Specific Terms available on line. These amendments shall be deemed to have been approved by the Privilege member unless he/she gives Europcar written notice of the contrary within one month following the relevant amendment. Europcar may end the Privilege Loyalty Program at its sole discretion by providing at least a ninety (90) days written notice to the Privilege Member. In any case, each Member will benefit from the advantages of his/her Privilege card until its expiry date.